Brian D'Ambrosio is a journalist, poet and author. His next book, "Sentiment and Sediment: 21 Poems," will be available in the summer 2017. Wild. Hairy. Big green tongue. George "The Animal" Steele was strange. He liked to eat ring turnbuckles and spit the innards. He wrestled like an animal, too. "The Animal" was unpredictable. Opponents never knew what he would try next. Crowds went crazy for this feral beast of wrestling of the '60s, '70s, and '80s golden age of the then-World Wrestling Federation. Outside the ring, he was always Jim Myers, a respected high school teacher and coach in the suburbs of Detroit, with a Master's Degree. He still signs autographs and makes guest appearances at conventions, but, for the most part, the "Animal" stays in his cage. An undiagnosed dyslexic, Myers struggled to graduate from Madison High School, in Madison Heights, Michigan. He lettered 16 times, earning four in track, basketball, baseball and football, and obtaining a football scholarship to Michigan State. After graduating, Myers returned to Madison High School in the early 1960s to coach football and start an amateur wrestling program. "I never ever watched the kind of wrestling I became involved in," said Myers, who lives in Cocoa Beach, Florida, with his wife of 58 years, Pat. "I was a football guy, mostly. But then I became a guy who was only earning $4,300 a year, with two kids, and a third on the way. Wrestling was much more lucrative than teaching was. Going back to my second year of teaching, in 1961-62, I was making $4,300 a year and needed a part-time job." Myers had a friend -- a huge entertainment wrestling enthusiast named Dave -- who gave him the phone number of local promoter Bert Ruby. 'Go on, Jim, go make a few extra dollars,' said Dave. Myers called the promoter, who invited him to his Oak Park, Michigan, home. He took one look at Myers, and muttered, "Beautiful!" Not knowing the business or exactly what the promoter had in mind, Myers was a little panicky. "I relaxed after I met his wife and family. He brings me back into his office, "Take off your shirt." He looks at all the hair on my chest, and goes bananas, "Beautiful!" We decided I'd be under a mask and I would wrestle as "The Student," wearing a cap and gown on, and I'd figure out the business." Myers was a villain, or in wrestling parlance, a heel -- and a darn good one, too. One time, a guy came at him with a knife after he had wrestled Pedro Morales. Another time, a mob chased his taxi through Manhattan after his battle with Bruno Sammartino at Madison Square Garden. "If you are good at what you do, the people absolutely hate you," said Myers. "When you become a cartoon character, then they love you. I put my whole spirit and lifestyle into being the nasty, brawling heel -- the guy who people resented -- and I put it all into the business of later being the crazy, wild cartoon character. Those were different times. In the 1960's, '70s, '80s, they were selling wrestling, and later, they were selling lunch buckets, action figures and t-shirts. Different." In the 1960s and '70s, Myers said that wrestlers had more time to tell the story, to weave and massage the narrative. "The television matches were 8 to 12 minutes," said Myers. "But the house shows when I was a heel, they would last 35, 40 minutes, or even an hour. In wrestling, you are telling a story, and it takes a lot of time to tell a story correctly. There are not a lot of guys who know how to tell a story now. And they don't do it at all today. And you can't tell the story in five minutes -- it should take at least five minutes to know if you are a good guy or a bad guy." Following his matches, Myers returned to Madison Heights, Michigan, where he taught physical education and coached football and wrestling. In 1967, WWF stalwart Bruno Sammartino was wrestling a show in Detroit and after WWF officials spotted Myers, then age 30, he was invited him to Pittsburgh. Wrestler "Jumping" Johnny DeFazio, suggested that since Myers was in the "Steel City," he should call himself "Jim Steele." Myers didn't like the name Jim. 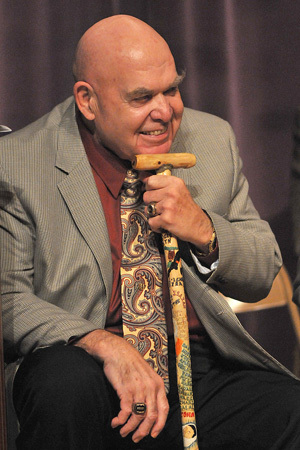 Another person suggested George Steele, and a wrestling personality was born. Later that year, Myers, or George Steele, first appeared unmasked on television. It wasn't his choice. "I'm teaching and coaching," said Myers. "I obviously don't want to use my real name. Television was territorial then, so I didn't mind being on television. I was wrestling a program with Bruno. I go there with my mask and they say, 'no mask.' A masked wrestler works the show with his body. When I took the mask off, I started flailing, wild, crazy, and it was just natural." Near the end of 1967, Steele was wrestling Chief Jay Strongbow (Joe Scarpa), and the match just wasn't going over well with the fans. Too boring, Steele surmised. Deciding that he needed to wake up the crowd, Steele spontaneously fed the ring turnbuckle to his foe. "I saw the turnbuckle over there," said Steele. "I went over to take a little chunk, and I started rubbing that right in his face. It turned into a riot -- howls, hoots. From then on, I'm thinking, 'why not use the turnbuckle as a prop?" Steele picked up larger engagements and remained verbal in his interviews. His roughhouse tactics in the ring and his overly hairy frame led to the harangues of "animal." After Steele grabbed the microphone and mockingly shouted something unintelligible about not being an animal, he realized that he had struck a nerve. The more guttural and animalistic he yelled, the more they called him "The Animal." In the mid-1980s, George "The Animal" Steele's popularity spiked, as did the trajectory of the World Wrestling Federation. Myers could no longer keep his career a secret. He left coaching and teaching in 1986; the money had gotten "too big to leave in the rearview mirror every fall." "It was all totally backwards," said Myers. "I start going full-time, all-out, so big, in a young man's career at age 50." Myers is reluctant to get too sentimental about the rise of wrestling's popularity -- that's because that rise entailed unalterable changes and shook the original foundation until it crumbled to bits. I spent most of my career with Vince McMahon Senior, and when Vince Junior got in, it started changing. I respect Vince Junior, and I respect him as a business man, and for his marketing. But he didn't understand wrestling, or he just had a different view. He didn't understand the roots of wrestling, and he changed it so much. Well, he is a genius in a lot of areas, but not at wrestling. I respect him for his business acumen. The art of the business in New York died with the father. But the son, he took a million dollar business and turned it into a billion dollar business. Lost Art of Wrestling: "Like a Director"
McMahon phased out the scientific wrestlers in favor of mass appeal gimmicks. "Two Bob Backlunds wrestling one another would not sell a ticket today. You need the nice guy and the one who is going to cheat. That's how you sell tickets. It's all good versus evil. Even good amateur wrestling doesn't sell a lot of tickets -- but the heel against the baby face does." Switching from George "The Animal" Steele to Jim Myers was not smooth. Not surprisingly, going from wrestling in front of 20,000 screaming folks at Madison Square Garden to the teachers' lounge could be tough to handle. "When I'd come home, we'd have to get "George" in the box, and remove "Jim" out of the box. If it wasn't for my wife, I would have gone nuts. I don't know if anyone normal could have lived that way. I taught school, and coached in the summertime. I'd teach, get in the car, drive 300 miles, come home at four in the morning, and then I'd be up for work at seven. Until I got my feet on my ground, wrestling felt like a vacation most of the time." Myers refuses to call wrestling fake -- the slams on the concrete, the physical toll, the vengeance of the fans. He said that when he first started wrestling, little, if anything, was preplanned. When you walked into the ring, both wrestlers knew who the winner was going to be. But just how they delivered the outcome was mostly a matter of pure originality. "Wrestling was not fake," said Myers. Wrestling was predetermined. When we wrestled, we did it in the ring, we called it in the ring. We didn't choreograph things. We knew who was going to win, but that was all. Normally, the heel always was the director, the one who called the match, whether he was the champion or not. It had to be that way, because, psychologically, the heel needed to be able to control the bout and bring it back down to a safe level, so he could safely walk back to the dressing room. Early on in my career, I loved the heat. I loved the riots. But then people were telling me, it's bad for business, stupid.' Early on, I resented that it wasn't real, but as I continued to wrestle, I learned respect and I felt respect for the business. It may sound corny, but I felt like a director who was leading an orchestra. That type of wrestling is a lost art. At the height of his popularity, Myers contracted Crohn's Disease, which forced him quickly into retirement. "I was mainstream and big time, and the whole cartoon character thing was going fantastic. I came down with Crohn's, and, after my last match, I spent 31 days in the hospital, with IVs. I was 50 years old at the time, and maybe I shouldn't have been running with young wolves." After retirement from wrestling and teaching, Steele moved to Florida. The pain of ring injuries, ten years of enduring a life-threatening disease, and an overwhelming depression plagued him. "I had sleeping pills in my mouth, and the radio turned to a country and western station." He said that in his deepest moment of distress, he found God. He said that he beat Crohn's with guidance from his faith and that he is totally cured of it. "I visualized my digestive system getting better," said Myers. "My colon had already been destroyed. But somehow I saved the rest of my digestive system. I've been healed since 1994. The doctors don't believe it. I lived in a living hell of a lifestyle, on the road, partying, that's what we were. Guys died from drug overdoses. It was either death, or find the Lord." 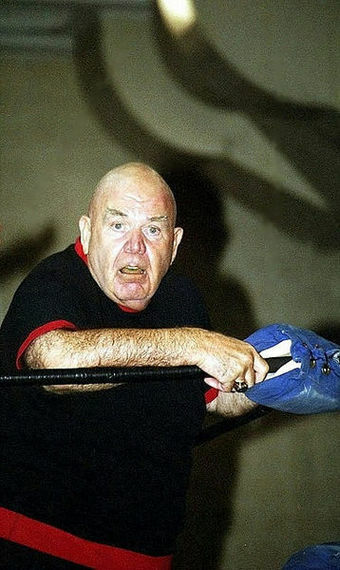 Myers understands that George "The Animal" Steele will always be a memorable name in the wrestling entertainment business. "I never wanted to be a wrestler," said Myers. "It's a cold, cold business. That's all." 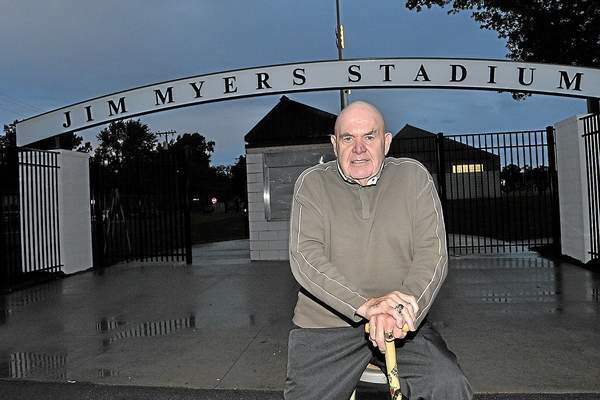 At 77, Jim Myers has a sweet legacy of his own. The Madison High football stadium where he coached now bears his name -- his real name. The sign is metal and arched and it hangs above the entrance to the field. "In the twilight of my life they named a stadium after me," said Myers. "I'm not dead yet, I suppose that there is time to still screw up." Photos courtesy of Jim Myers. Brian D'Ambrosio lives in Montana. His next book, 'Warriors in the Trenches,' detailing the lives and careers of 30 legendary boxers, entertainment wrestlers, football players, musicians and actors, will be available in the fall.